Virginia has been all about the love for 50 years! 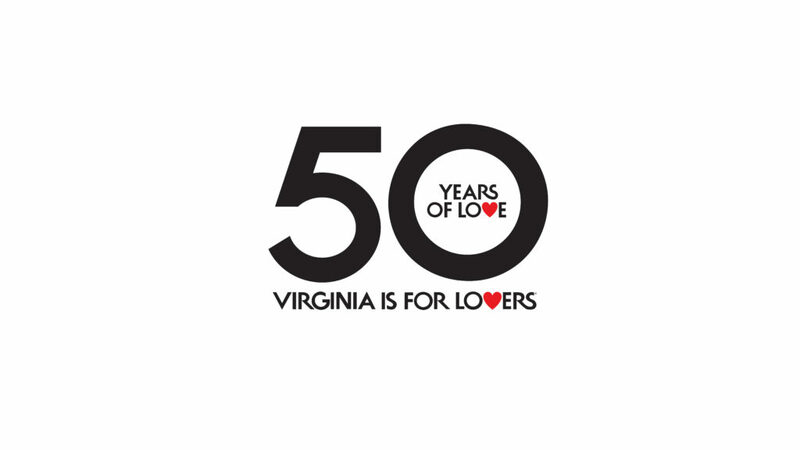 And what better way to celebrate that milestone anniversary slogan, Virginia is for Lovers, than with a campaign celebrating 50 years of love? 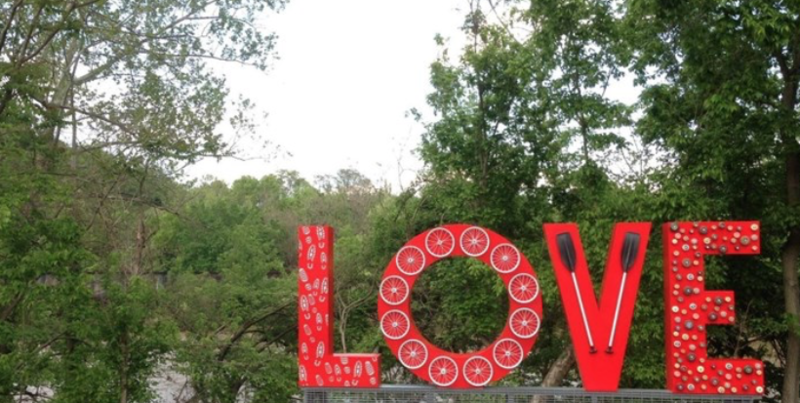 Sponsored by the Virginia Tourism Corporation, the LOVE art started out as simple white letters that the organization could take around to Virginia Welcome Centers. The goal was to highlight the state as a family destination with love at the heart of every Virginia getaway. The signs were also a nice way to play off of the “Virginia is for Lovers” slogan, a hugely successful slogan. Then, VTC partnered with tourism destinations around the state which expanded the program to create new Virginia LOVEworks. Now, the state has 48 LOVE signs (and growing) that reflect each community’s unique features. Why Not Create Your Own LOVE sign Bucket List? Have you seen a Virginia LOVE sign? No? Time to get traveling! Why not take your own LOVE journey around the State of Virginia? With LOVE signs decorating 48 communities, there’s no shortage of places to visit. Simply decide the route you want to take, plan it, and go! Farmville’s LOVEwork depicts the High Bridge which was the site of one of the last battles of the Civil war. It also includes an inlaid 1918 Sanborn Fire Insurance map reproduction of the Downtown district. Constructed from locally hewn and crafted materials, it was assembled right on the site. Lynchburg showcases the Blackwater Creek trails system which meanders throughout the city. The “L” features shoe cut-outs for walking and hiking. The “O” has children’s bicycle wheels which represent all the biking opportunities in the area. The “V” has attached canoe paddles and the “E” features skateboard wheels. The historic train depot was the catalyst for Culpeper’s downtown successful revitalization effort, which began in 1987. Now it’s home to Culpeper’s visitor center, and that’s where the LOVE sign also finds its home. Decorated in an old movie reel, it highlights the emerging arts in Culpeper. For the beach lover, we recommend a LOVE trip from Virginia Beach to Chincoteague to Cape Charles. The thoughtfulness and talent that has gone into each of these signs will have you clicking away! As a side note, we’re proud to say that Cape Charles was among 39 Virginia communities to receive the Virginia Tourism Corporation’s grant to help us promote our community. And yes, we do love showing what makes a Virginia vacation so special! 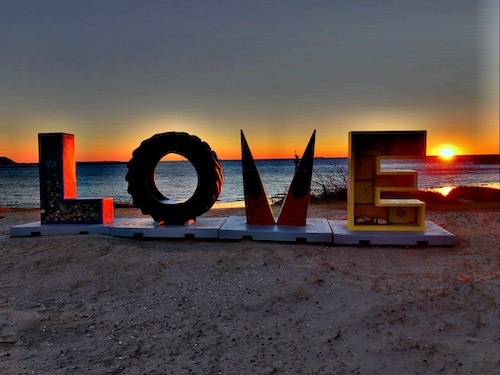 The Summer of Love celebrations will begin July 6th in Cape Charles, so follow along @capecharlesvirginiascape on Facebook or visit Cape Charles Virginia’s Cape to learn more details! Plan your summer vacation now. Don’t wait. Book some love at Bay Haven Inn of Cape Charles! This entry was posted in Bay Haven Inn Experience, General, Main Street, Summer, Uncategorized, Virginia and tagged Bed and breakfast, coastal bed and breakfast, lodging, LOVE sign, LOVEworks, Virginia is for Lovers, visit virginia by admin. Bookmark the permalink.